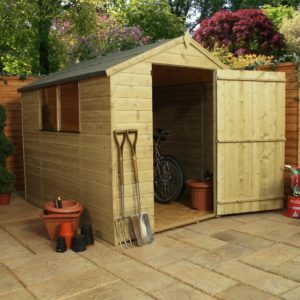 Get a Sheds to Last pressure treated garden building and get a guarantee of durability and value for money. It’s true that pressure treated sheds are the perfect outdoor storage options regardless of the weather. 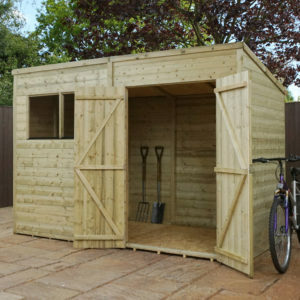 Due to the intense treatment with anti decay and termite repellent chemicals, you can rest knowing that your shed will be intact for 10-15 or more years. At Sheds to Last, our vast array of pressure treated sheds come in different sizes and shapes. We have pent style and larger units that can be used as workshops. Take advantage of our durable low maintenance buildings that outlast conventionally treated storage sheds. Pressure treatment is appreciated to provide practical guarantees and product warranties. We only supply from manufactures who use premier cladding in the manufacture of the buildings. When you buy pressure treated buildings from Sheds to Last, we make sure that you enjoy your desired look. We will help you add decorative treatment that will match your exterior space. Our sheds come in different styles; Apex or Pent and the price is pocket friendly. Whether you want the pressure treated units for whatever reason/use, we will supply the size, shape or the design that suits you best. When you make an order, we will deliver and we can even do the installation. The colour used on pressure treated storage building determines the aesthetic appeal on your building. At Sheds to Last, we take precaution to provide a shed that complements your exterior décor. We make sure that the colour blends with your garden perfectly. Save your money with pressure treated buildings from Sheds to Last today.